Jean Grey’s team of X-Men. Even though the story of the X-Men began as a metaphor for the Civil Rights Movement and the importance of diversity, the series’ message about what racism looks like has always fallen somewhat short. X-Men: Red is trying to change that. Because Marvel’s mutants exist in a world where people develop mutant-like super abilities literally all of the time, it’s somewhat odd to use them as a way to talk about the kinds of racism that real world minorities experience. Interestingly, X-Men: Red, from writer Tom Taylor with illustrations by Mahmud Asrar and Rain Beredo, feels like the first step in addressing that weirdness—and in rethinking the ways that Marvel can and should be using mutants to tell more nuanced stories about discrimination that reflect the world we live in today. X-Men: Red (“The Hate Machine) picks up soon after the events of Phoenix Resurrection: The Return Of Jean Grey, with Jean Grey’s newly formed team of X-Men on the run after Jean’s framed for murdering an ambassador at the United Nations. As Jean has been trying to figure out who’s attempting to sabotage her grand mission to change the way the world sees mutants, her X-Men have gradually noticed a steady uptick in anti-mutant hate crimes committed by humans. The specific reason behind the attacks doesn’t become clear until the X-Men find themselves in India on a mission to free a young technopath called Trinary, who’s being held prisoner by humans who want to use her powers to their own ends. Of course, Jean and the X-Men’s siege on Trinary’s location is met with resistance from her captors, but the mutants are shocked when locals from the neighborhood attack them and even more confused when Jean can’t telepathically force the humans to retreat. The problem, Trinary explains after the X-Men spirit her away, is that Jean’s psychic abilities aren’t able to override the microscopic Sentinels that have embedded themselves into the humans’ amygdalae. Trinary explaining to Gabby and Nightcrawler that she can’t deactivate the Sentinites. Unlike previous incarnations of Sentinels, the Sentinites are specifically designed to generate distrust and fear of mutants in baseline humans that manifests itself as hatred. The Sentinites imbue an infected human with a regular Sentinel’s ability to detect mutants, but rather than attacking mutants with high-tech lasers, the human would suddenly be taken over with the desire to physically attack or kill them in more traditional ways. If you didn’t know that a mob was infected with Sentinites, you wouldn’t necessarily interpret their attack on mutants as the doing of a supervillain, but perhaps just a group of garden variety racists. But the true insidiousness of the supervillain’s plan in this case is much more subtle than their torch-carrying pawns would suggest. After successfully curing Storm of a Sentinite infection that almost causes her to kill herself, Trinary explains that the wave of attacks on mutants are playing into the conversations people are having on social media. Some see the attacks as the violent acts of bigotry that they are, while others see them as humans merely trying to defend their species. As the number of attacks continue to grow, then, a feedback loop is created that, in theory, has the potential to embolden even people who aren’t infected to act on their racist beliefs. Jean’s X-Men learning the true nature of the Sentinites. Obviously, X-Men: Red’s iteration of the “mutant as minority” metaphor doesn’t exactly line up with the realities of our world. But it’s a marked evolution in the concept that has very real parallels to the shape that violence against marginalized people has taken in recent years. It’s impossible see mobs of people carrying torches as they descend on mutants and not to be reminded of the white supremacists who marched through Charlottesville in 2017. The idea that the humans in Marvel’s books could witness those attacks and not see them as blatant racism echos the ways in which footage of unarmed black people being gunned down in the streets by police does not typically lead to any sort of meaningful legal justice here. The evil that Jean’s X-Men are facing is specific to mutants within the content of the series, but narratively, it resonates as a story that is about any and all aspects of identity, be they race, gender, or sexuality. Of course, this story arc can’t go on forever. 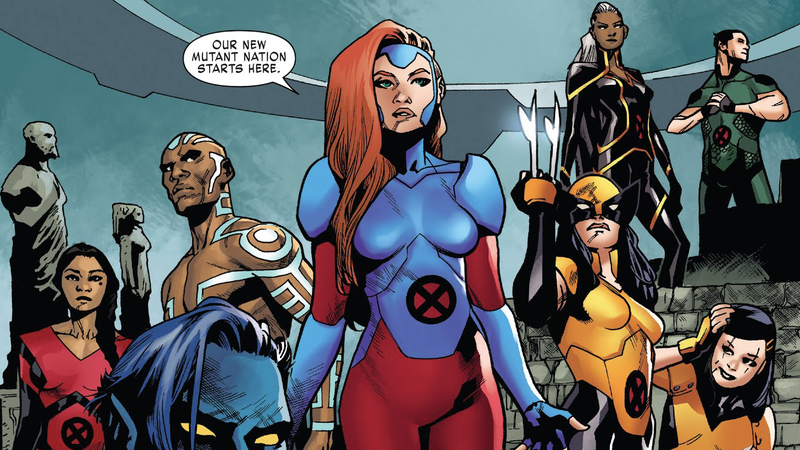 Jean and company will prevail and they’ll move on to their next big bad, but “The Hate Machine” is pulling the X-Men: Red into our present day in a way that says promising things about the series’ future.